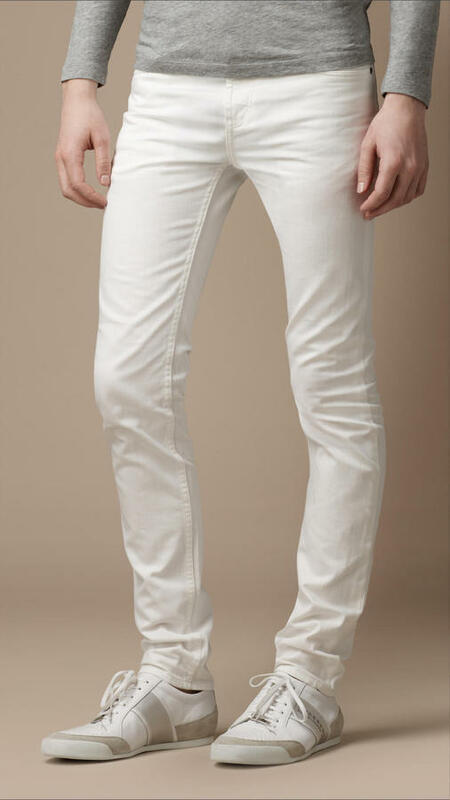 If you're searching for a casual yet on-trend look, choose a blue long sleeve shirt and Burberry white jeans. Both garments are very comfortable and they also look amazing when paired together. Bring instant glamour to your getup with grey suede loafers. 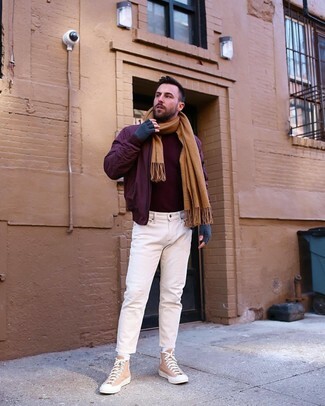 A burgundy bomber jacket and Burberry Shoreditch White Skinny Fit Jeans are a great outfit to carry you throughout the day. Feeling creative? Dress down this outfit by slipping into tan canvas high top sneakers. Contrary to what you might believe, being a dapper dude doesn't take that much time. 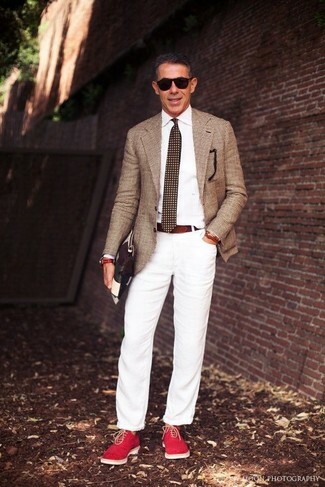 Just opt for a brown wool blazer and white jeans and you'll look incredibly stylish. Add a sportier feel to your outfit with red suede boat shoes. 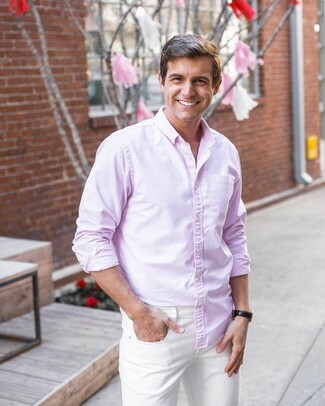 This pairing of a pink long sleeve shirt and white jeans is a safe and very stylish bet. If you're scouting for a casual yet sharp look, consider teaming a grey zip neck sweater with Burberry Shoreditch White Skinny Fit Jeans. Both garments are super comfortable and will look great when worn together. Contrary to what you might believe, being a dapper dude doesn't take that much time. 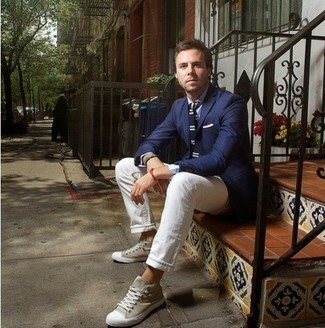 Just consider pairing a navy blazer with white jeans and you'll look incredibly stylish. Add a sportier twist to your ensemble with grey high top sneakers. If you're hunting for a casual yet stylish getup, wear a light blue denim jacket with Burberry Shoreditch White Skinny Fit Jeans from Burberry. Both garments are super comfy and they will also look great when paired together. 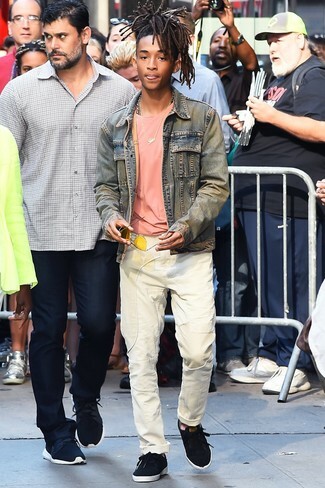 When it comes to footwear, this outfit is round off nicely with navy suede low top sneakers. If you're on the hunt for a casual yet sharp ensemble, team a white and red and navy horizontal striped crew-neck sweater with Burberry white jeans. Both pieces are totally comfy and they will also look stunning when worn together. 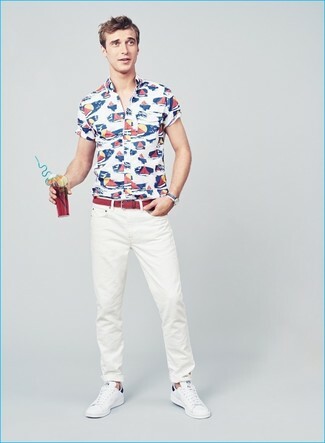 If you're in search of a casual yet seriously stylish getup, consider teaming a white print short sleeve shirt with Burberry Shoreditch White Skinny Fit Jeans from Burberry. As well as super comfortable, these pieces look great together. 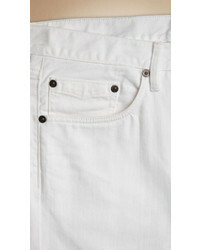 Round off this ensemble with white low top sneakers.